The video promotion below makes it clear that K-LOVE claims that a $40/month gift is the reason why a child gets a warm coat. 1. K-LOVE listeners are told in many different ways that if they give $40 monthly to K-LOVE, a child will get a coat through an OW donor just because they called to give. 2. 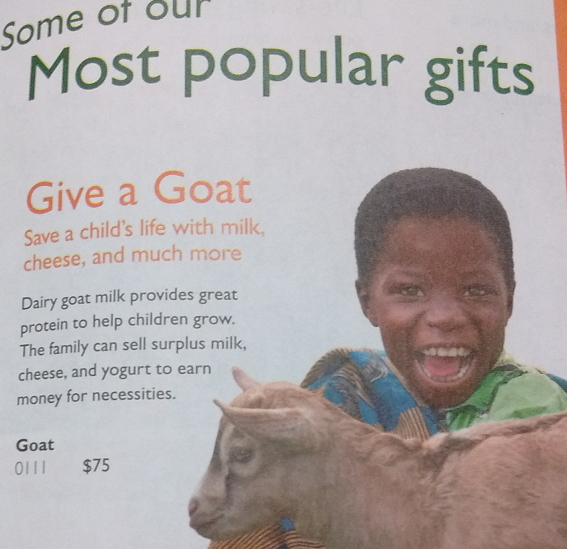 Although the information from K-LOVE and OW conflicts, I don’t believe that there are OW donors who base their gifts to OW on K-LOVE donors giving to K-LOVE. OW donors are asked to give to pay for coats that will be given away even if K-LOVE doesn’t promote OW. 3. In exchange for publicity during the pledge drives, OW allows K-LOVE to take credit for a coat giveaway. K-LOVE attends an OW coat giveaway event and credits K-LOVE and its listeners for providing the coats, even though the donations to OW were not made on the basis of K-LOVE pledges. K-LOVE and OW set up a dramatic illusion. Even though the two organizations agree before the pledge drive even starts how many coats they will give away (in exchange for the advertising), the K-LOVE on-air personalities pretend that the pledges matter. The coat for a needy child is held over the heads of donors. Will a needy child get a new coat? It’s all up to you, K-LOVE donor. Former employees I contacted confirmed that listeners are definitely under the impression that a $40 monthly gift to KLOVE/Air1 will cause an ‘anonymous donor’ to buy a coat for a child through Operation Warm. They say many K-LOVE employees believe every new, qualifying K-LOVE/Air1 listener causes this ‘anonymous donor’ to buy another new coat. “For those of us behind the scenes, it was alarming to find out it wasn’t true,” one told me. Before I explain more, I want to say that K-LOVE and OW were initially responsive to requests. However, as I pressed for more information, I stopped receiving replies from both K-LOVE and OW. Specifically, I asked directly if coats would go to needy children even if K-LOVE wasn’t involved. This question was never directly answered. 1. How many coats are given to children because of KLOVE new donors? In other words, how many coats go to children that wouldn’t be given to children if KLOVE donors didn’t donate? 2. Is there an Operation Warm donor that waits to see how many KLOVE donors give $40/month and then that donor funds coats corresponding to the number of new KLOVE donors? 3. If nobody donated $40/month to KLOVE, would Operation Warm give out the same number of coats to children per year? Here is what Brock with OW told me in reply. KLOVE and Operation Warm are partnering to celebrate and honor KLOVE listeners who support KLOVE’s mission through their Fall Pledge Drive. For every KLOVE listener who makes an EZ Pledge of $40 per month to enable KLOVE to continue its operations, a child will receive a new winter coat in honor of that listener. All of the EZ Pledge donations will be kept by KLOVE to support its operations and mission. Funding for the Operation Warm coats that are given to children will be made by Operation Warm’s donors. The donations to Operation Warm were not made in honor of KLOVE listeners, but we provided the coats in honor of them, thanks to the funding by our donors. Please note the final sentence. The donations were not made because (“in honor of”) K-LOVE listener pledges. However, in exchange for lots of advertising during K-LOVE’s pledge drive, OW gives a coat to a child to commemorate the donation. Does this mean that OW is holding on to coats waiting on K-LOVE donors to pledge? I don’t believe so, but if it does then I think donors should rethink giving to OW. Specifically, OW secures donors with intention to allocate coats for the Pledge Drive. Donors provide resources to OW based on the impact OW’s participation with K-LOVE and Air1 will have on OW’s mission. In turn, K-LOVE and Air1’s inclusion of OW during the Pledge Drive increases the visibility and promotion of the non-profit. Notwithstanding, if any of the coats allocated for K-LOVE and AIR1 would have been donated to those in need regardless of the Pledge Drive, the Pledge Drive provided huge promotional value to OW that arguably multiplied the number of donors and donations they otherwise would have received. In a follow up email, I asked Ms. Ford about Brock’s statement that money wasn’t given to OW because of K-LOVE donors. However, she did not answer. OW and K-LOVE appear to be at odds over OW’s donations. Ms. Ford told me “When you give, a generous donor comes along side of your donation and supplies a winter coat to a child through Operation Warm.” However, Brock at OW told me “The donations to Operation Warm were not made in honor of KLOVE listeners…” One explanation makes it seem that a donor at OW is waiting for a K-LOVE pledge to make the donation of a coat. 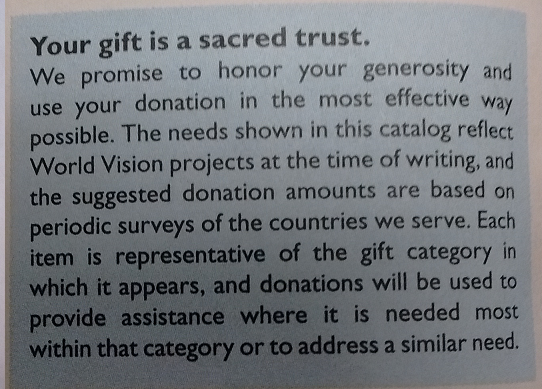 The other implies that donors simply give to OW independent of the pledge drive. Based on OW’s input and that of former K-LOVE employees, I don’t think there is direct linkage between K-LOVE pledges and an OW donation. Throughout their promotions, KLOVE clearly states that the EZ Pledge donations stay with KLOVE. Also, Operation Warm pays no fee to KLOVE; rather, KLOVE provides Operation Warm with very valuable promotional support which results in more support for OW and therefore more children receiving new winter coats. Prior to our campaign with KLOVE, we mutually agreed on the number of coats that would be provided in coordination with the pledge drive, up to a certain number of coats. If KLOVE met that number, that same number of coats would be provided to children through Operation Warm this season. KLOVE’s promotional support has allowed us to spread our mission and receive support we would not have received without them. We’re happy to report that KLOVE met their pledge numbers and 27,000 children throughout the country will receive a new coat that did not have one before! I asked both Stacie and Brock what happens to those coats if K-LOVE’s donors don’t come through with the amounts of pledges agreed to by the two organizations. Neither organization answered. I believe those coats would go to children in the name of some other media partner or no media partner at all (OW gave away over 300,000 coats last year). In other words, if OW donors give money for coats, a child will get a coat, pledge drive or not. Putting all of these statements together, it appears to me that OW gets donations from their donors to make coats. 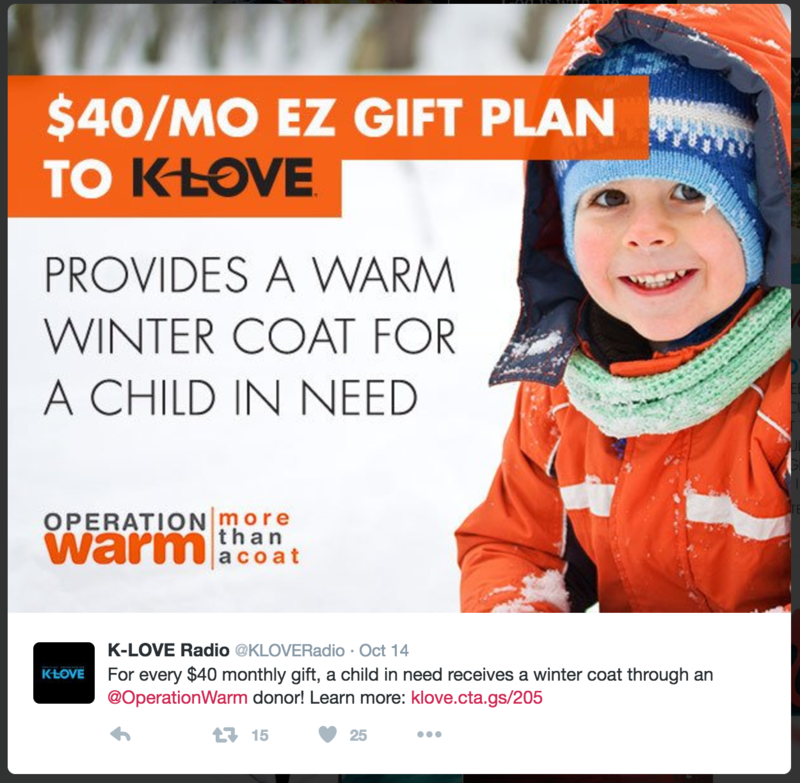 K-LOVE offers advertising to OW in exchange for the right to say that existing OW coats are being given in honor of K-LOVE donors. OW and K-LOVE agree in advance how many coats K-LOVE gets to leverage to listeners. At the end of the pledge drive, K-LOVE tells OW how many qualifying pledges were made and then OW allows K-LOVE to do a publicity giveaway event with coats which would have been given to children anyway. I sent the paragraph above to K-LOVE and OW and asked them to correct any factual errors. I did not get a response from either organization. If it is true that OW would withhold coats provided with OW donor dollars because K-LOVE donors didn’t make a qualifying pledge, then I think donors should question why OW would do that. According to Brock at OW, donors didn’t give money in honor of K-LOVE pledges and so the coats purchased/created with those donations should not be held back. Remember, K-LOVE’s CEO made nearly $600,000/year in FY 2015, with eight executives earning over $200k. Some of the on-air personalities make well over $100k. In FY 2015, K-LOVE/Air1 took in over $150 million and had a surplus of $64 million. Think about that the next time a single mother working two jobs calls K-LOVE to offer her sacrificial donation. Even if one rationalizes the pitch, please understand that a donation to OW instead of K-LOVE will actually provide coats to children that won’t happen otherwise. I am disappointed by this deception and call on donors to reconsider rewarding it with their funds. This Christmas there are real needs in our communities which can be directly met. Join me in giving to food pantries or some other local charity (or even Operation Warm which seems to be a pretty good group other than colluding with this donor illusion) which will get resources to needy children. *Air 1 also uses the same promotion. Air 1 is a sister network also owned by Educational Media Foundation. Many of those stations play less praise and worship and more Christian rock than K-LOVE. When I say K-LOVE, I mean both networks. Some would say, Pastor Mark, I disagree with you. Let me speak to you very personally. You’re wrong. You’re wrong. Now I know you’re not supposed to say it like that, but if you don’t say it like that, people are confused, so let me make it clear. I started in a home, my parents were um, Irish Catholic, okay? So we were the O’Driscolls from County Cork, southern Ireland, and Catholics are pro-life. I somehow grew up, and I started studying in high school, and I was a debater, and a thinker, and a bit of a hack philosopher. And I came to actually take not only a pro-choice position, but a pro-abortion position. Forced population controls. So when Gracie and I met, she came from a pastor’s home, she was strongly pro-life, and I was strongly pro-abortion. And we would have these debates. And we were friends in high school. And she was right, and I won the debates, because I’m a terrible person to debate. My mom said it was like raising a small attorney. That’s what it was like. So I can debate, I can think on my feet, I can articulate a position, and I can win a debate, even when I’m wrong. And so I would win these debates with Grace, and she would get very frustrated, because she was right and I was wrong. And I came to believe in the position, for a while, end of high school, early college, called Malthusian eugenics. Now if you’ve done your homework, I’ve done mine, too. I probably know your arguments and I could probably argue your arguments. And it comes out of this evolutionary belief that certain people and races are more evolved and fit than others. And that other races are less fit and less evolved, and as a result, we should terminate the life of those who are less fit, so the race can excel. This Malthusian eugenics position was held by Nazi Germany. This Malthusian eugenics position was held by Margaret Sanger, the founder of Planned Parenthood. She was a disciple of Malthus. I read all of their literature, I did my homework, I actually won a high school debate, and a college debate, on this position. I was so good at it, in college, in a large philosophy class, I won the debate, and my professor, who was an African Marxist, asked to mentor me as a student leader for abortion rights. I did believe for a season, in a full evolutionary ideology, that certain people are more advanced and more valuable than others. We should keep those who are valuable, we should get rid of those who are not valuable, and like all arrogant people, I assumed that I was one of the more valuable evolved ones. This is why Planned Parenthood puts its clinics historically in poorer neighborhoods to serve certain races, to eliminate certain people from having children and entering the world. You may not have known that, but you can trace the history. Just do your homework. Look at Malthusian eugenics, and look at the history of Margaret Sanger. I asked a former insider at Mars Hill Church if Driscoll ever mentioned these views. The source had never heard about the debate victories but had heard in general terms about an interest in Malthus. Although he did mention the debates in this Mars Hill Church article, it is a little hard to place when his African Marxist professor wanted to recruit him based on the history he described in Real Marriage. In any case, I post this because I want to address a misconception about those who accept the scientific foundations of human evolution. Driscoll implies that those who accept an evolutionary account of origins also believe in eugenics. This, of course, is not true. I accept the evidence for evolution but I certainly don’t believe in eugenics. I work with numerous colleagues here at Grove City College who accept evolution and none of them believe in eugenics. Holding to an evolutionary account does not require an individual to believe “certain people are more advanced and more valuable than others.” Also, believing God created in six days does not prevent such a belief. I grew up in small town Southern Ohio where many young Earth creationists believed whites were superior to all others. UPDATE: Wenatchee the Hatchet wonders if Driscoll fully abandoned his Malthusian beliefs. I had forgotten about Driscoll’s quaint “shoot the dogs” strategy of handling underperforming church leaders and strategies. Furthermore, Driscoll’s teachings about demonically inspired “family lines” may reveal left over influence from those Malthusian days. Time will tell if Driscoll continues his Mars Hill mentality at the new church. UPDATE: I updated the title since some concern was expressed by readers that I focused unnecessarily on Driscoll’s past views. As WtH points out in his post, those views may have infiltrated his current views, but even so, I think the new title (thanks to Ragan Ewing) better captures the reason I posted. New first 100 days task – Deduct Millions of Illegal Voters. In a speech to a Catholic group published by Buzzfeed, President-elect Donald Trump’s chief strategist Stephen Bannon presented his view of the world and political goals related to that view. The speech and subsequent Q&A are revealing and should be read carefully. While there is much to learn from the transcript, I focus now on Bannon’s statements about racism. Trump’s movement has attracted much of that “baggage.” Bannon’s appointment as chief Trump strategist has been lauded by the KKK, neo-Nazi’s and other racist organizations and leaders (e.g., Richard Spencer, David Duke). Although Bannon calls the racists “baggage,” it doesn’t appear that he does anything obvious to discourage it. Bannon is aware of the racists in his movement but, if anything, he has encouraged them through adopting the platform of the alt-right at Brietbart. He says they will be washed out, but how will that happen if someone is not doing laundry? The questioner asked Bannon how to counteract the movements which appeal to racial identity as a reaction to large corporate interests. Bannon’s answer did not address the racism, but said crony capitalism was to blame for what he called tribalism. On the economics front, his argument is appealing. The middle class is working harder for less but seeing the wealthy class have more. Capitalism is working for the wealthy but not the little guy. Bernie Sanders touched this sentiment but offered a different ideology as a solution. Bannon, however, tolerates this racist tribalism in the service of his broader goals. Although I don’t think it would have mattered, I wish this transcript would have surfaced before the election. This is a pretty straightforward statement that Bannon’s movement uses racists to further his broader ends all the while asserting the “baggage” (dare I say “deplorables?”) will somehow be “washed out.” Evangelicals who supported this need to recognize the deal with the devil they have made. Bannon dresses his tolerance of racism in religious language of Christianity. I expect that religious people will find their values severely tested over the next four years. What will evangelicals, particularly white ones, do when a movement that tolerates racism is pitted regularly against achieving religious liberty goals? So far, many evangelical leaders have winked at the racist concerns in the service of other goals. I don’t have expert knowledge of these movements but what I do know tells me that history is not on Bannon’s side. If anything, smaller acts of aggression and dehumanization toward a identifiable group have degenerated into acts which are much worse. Preventing this degeneration will continue to animate those opposed to Trumpism and the unholy alliance it tolerates with racists. Such a standoff could be prevented. If Trumpists and his evangelical sympathizers draw a sharp line against the “aspects that may be anti-Semitic or racial” (aka the “baggage”), the movement would less corrosive and have more chance to make some positive changes. Otherwise, I pray it fails in time for the mid-term elections.